Volume 2 is LARGER and has MORE ROUTINES, TRICKS and ADVICE than volume 1. 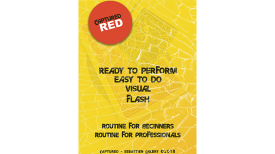 This has OVER 55 routines direct from professional performer's repertoires. Everything from walk-about to stand-up shows. Many with props you can make yourself, or have in your cupboard. "When Paul asked me to contribute to volume 2 I jumped at the chance .So here we are with another volume chock full of advice, tips, scripts, routines and tricks to entertain children and families with. Use them well." This completes the two volume set for performers who want to add some mentalism in to their show. Anybody who has purchased Volume 1 will tell you that mentalism CAN and IS being performed by magicians and mentalists for younger minds around the world. This product was added to our catalog on Sunday 10 February, 2013.